"Now prepare to be amazed..."
This DMOD is tagged on the Dink Network not only as a demo, but as unfinished. It seems that Mr. Trout intended a larger scope not just for the full DMOD, but even for the demo. This makes sense. What's here seems to be an introduction, establishing the motive for your quest; it ends just as things actually get going. This time, the protagonist is one Saben, winner of the "tiny torso contest" three years running. And they just went ahead and gave him the "long legs award" for life. Of course, his appearance on the title screen has no bearing upon the game, where he's represented by the Dink recolor from "Friends Beyond 3: Legend of Tenjin." This was a decent idea. It's a relief that this isn't yet another DMOD that tells us to take it on faith that the guy in the game isn't Dink even though it looks just like him. Unfortunately, he reverts to the regular Dink palette whenever you push anything. While I'm at it, there were some other problems. I saw a tiling error, incomplete hardness, a pillbug that was stuck on map hardness, and one of my least favorite things: a sign that doesn't say anything. It might seem like a tiny thing to get hung up on, but every time I see an unscripted sign, it really affects my opinion of the entire DMOD. It's like the sign actually says "Hi there! I am proof that nobody, not even the author, tested this. If they did, they sure didn't care that I don't work!" There was a sign like this in Dink Forever, so I should know. I respect a villain who's too practical to whip out the usual, "none shall disturb the mighty etc." I mean, obviously somebody did. "Should" makes more sense. Saben reveres and seems to serve his neighbor, the wizard Merlyn (no relation). Declaring himself on the verge of some great discovery, he bids that Saben go fetch him some dragon's blood from a nearby witch named Rafi Shaaban. Merlyn warns Saben that the witch might not be friendly, but she agrees to help if Saben will fetch her some mushrooms. After he does that, she gives him a mysterious package and tells him not to open it before giving it to Merlyn. The package causes a demon to appear when opened, killing Merlyn. 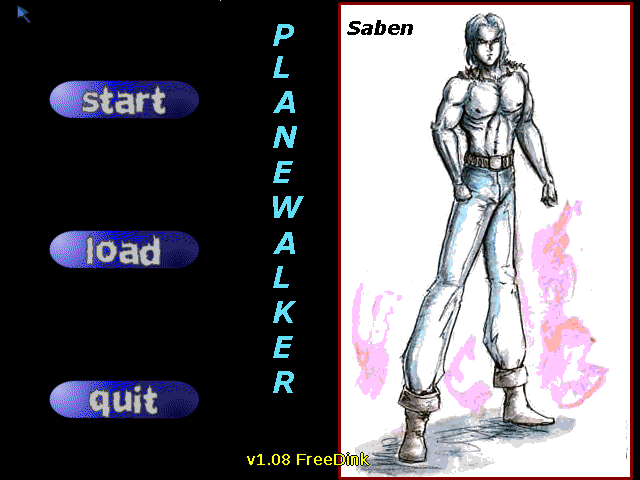 Saben is able to finish off the demon, and seeking revenge, he pursues Shaaban as she flees through a portal to another realm. This is where the demo ends, although there's a couple of people that you can talk to in the next section. It sets a release date of November 2003 for the final version, but the author was long since onto other things by that point, I suspect. Since you're blocked off at every turn from trying to explore, it seems like the story was intended to be the main point here, but I had a few problems with it. First of all, these events are meant to give the hero motivation to seek vengeance, but we never really learn why he admires Merlyn so much. In fact, even the basic nature of their relationship is never made clear. Second, it kinda bugs me that we never learn what his "great discovery" was going to be, and it doesn't seem like we would've learned it in the full game, either. Finally, Merlyn was absolutely out of his mind for opening that box. He has at least an inkling that Shaaban may be treacherous, and Saben tells him about her insistence that Merlyn be the one to open the box. As soon as the witch said that, I said out loud, "that box is gonna kill that wizard," and I don't think I was being especially clever. He kinda only had himself to blame, really. I think this would've turned out to be a fairly good DMOD if it had been finished. 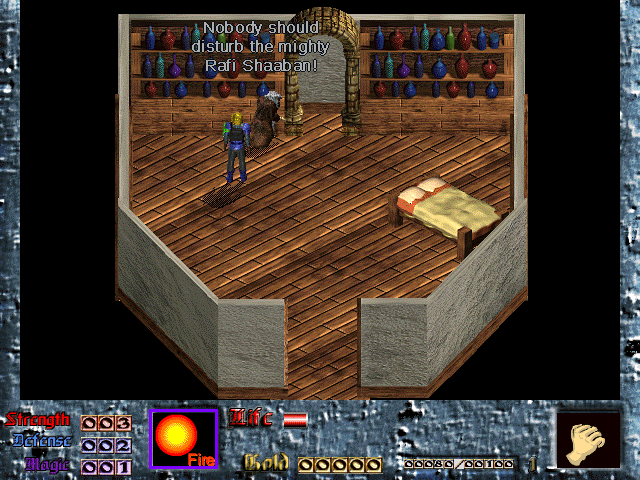 The characters had some personality, particularly the witch, and SabreTrout's trademark of describing a character in the dialogue tree title always adds an interesting bit of atmosphere. I'd hope that, this demo being an intro area, the full game would've felt a bit more open - I don't have a problem with linearity, but there's no point at all to trying to explore in the demo. It's a bit sloppy, but I've seen much, much worse. That is all the DMODs of 2002! Thirty-four of them, plus a couple of 2001 DMODs I ended up covering in this topic. Year wrap-up will be coming at some point more than a week from now, as I'm going out of town in a few hours. See ya then!